A beautiful garden to take a leisure walk and let the worries fly away! This is how Boscombe Chine Garden can be described. Beautiful scenery filled with flower beds and large grass areas to wander around, golf and water-themed playground are some of the highlighted features that make this garden so special. Take a tour within the garden and you will seea variety of trees on the bank of the chine and a range of wildlife as well. Walk down the wildlife quiz trail to explore the plants and the wildlife habitat in the garden. However, the garden underwent a bad phase for fifty years. Later in the 1990’s with the help of a strong community, a Heritage Lottery Fund was founded. This fund helped the garden to regain back its lost glory. Today the garden houses a tennis court, a multi-purpose ball court, a children’s park and a terrace café for refreshment. It is a great place to take a walk to the sea. Recommended time to visit is 03pm– 06pm. Mini Golf: 10am– 06pm (1st April to 1st November). Love this? Explore the entire list of places to visit in Bournemouth before you plan your trip. Fancy a good night's sleep after a tiring day? Check out where to stay in Bournemouth and book an accommodation of your choice. 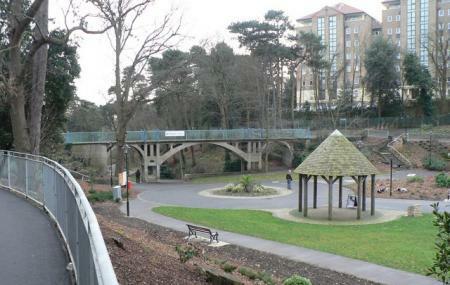 How popular is Boscombe Chine Gardens? People normally club together Boscombe Arts Trail and O2 Academy Bournemouth while planning their visit to Boscombe Chine Gardens.